After all this time, I’m sure some of you forgot that my original E3 2017 interview with Final Fantasy XIV’s Naoki Yoshida was supposed to have a part two. That’s OK, since, well, the team’s been a bit busy since then. With the expansion out and some fires smothered, the much loved game director finally was able to get back to some of my questions. Naturally, the first question I had to ask was how Yoshida is feeling about Stormblood following early access, launch, and the release of the first content patch updates. For now, he said (through translators) that he’s relieved but that the expansion had “an unexpectedly high number of new and returning players [who] came back to the game, which caused some issues and frustration.” One of them was the DDOS attack, for which he again offered apologies. “We have heard feedback about making zone instances selectable [when teleporting], and I understand that desire, but if we allow that, it counteracts the original intention of spreading out users, so I think it’s a difficult situation. Moving forward with future expansions, this is something we will revisit, and hopefully we can further improve functionality of the system. Since I had had a second opportunity to talk to Yoshida, I also got to pose a few questions from Massively OP’s Final Fantasy columnist Eliot Lefebvre in the follow-up. The introduction of the Lupine characters in Yanxia as a kind of off-hand reference seemed to catch his attention, so I asked Yoshida if players will learn more about them. For example, are they considered beastmen, or maybe a different sort of spoken race similar to the Hyur and Au Ra? Yoshida said that “there is actually no difference between the human races and beastmen; the human races designated certain races as beastmen on their terms. That being said, you may already be aware from interacting with the people of Yanxia, but it seems they do not think of the Lupine folk as beastmen.” At the moment, the team has yet to determine how deeply it wants to delve into the Yanxia’s backgrounds, but there’s some good news: “It may be dependent on feedback [the team] receives from players,” so make your voices heard! I’m not a Final Fantasy junkie, though I am that rare duck who loved FFVIII more than FFVII . That being said, Yoshida is a director who talks like a player, and while I may not be playing his game, I can respect some of his decisions as an outsider looking in. Again, on the ground floor of E3 2017, one of the FF mobile game booth assistants noted that people were saying FFXIV was their favorite in the entire series, which speaks volumes in terms of quality. I mean no offense to other game developers, but sometimes their lack of player experience explains why they don’t “get” players. They can be quite intelligent and good at practical design, but without knowing their genre’s history, they often are doomed to repeat it due to their ignorance. In retrospect, these two paragraphs and Yoshida’s history inside the genre as a player and developer explain a lot of why Yoshida feels on the mark in terms of player attitudes, as well as why he seems to focus on player engagement so much. Finally, prior to E3 2017, I’d seen an interesting tweet from a sentient slice of salmon named Kirimi-chan. Later, Square-Enix Assistant PR Manager Adam Pelc pointed out that Yoshida was wearing an interesting shirt at the recent FATE event in Hamamatsu, so I had to ask Yoshida about his feelings on Kirimi-chan’s excitement about Stormblood. 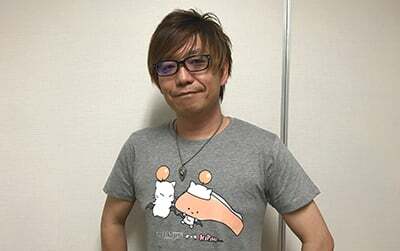 Yoshida’s normal style is not quite one that makes him seem like the type to associate with the likes of the Hello Kitty company (Sanrio), but “having the adorable Kirimi-chan play Final Fantasy XIV made [him] feel much closer to the character!” I was also jokingly notified that Kirimi-chan “is playing ‘Salmonal Salmontasy XIV. '” It was a good reminder that games and fans can transcend genre boundaries, a fact I often forget when I can’t see the people behind the screens. Thanks to Naoki Yoshida and everyone at Square-Enix who took the time to make this followup interview possible! Despite all the mishaps and hiccups on the way to where we are now, Yoshida-san always reminds me that there are very real human beings playing and creating the game we play, and he is always ready and willing to admit his and their mistakes and offer solutions and updates to issues. I’m hoping that FFXIV lasts a very long time more! That’s some MMO cred! I wasn’t too aware of Yoshida as a person before those last two interviews, but now I think I love him. The instancing really needs to allow for teams to warp in together. Numerous other games have that capability, it should not be hard for SE to do it. Nothing more frustrating to teleport a team to a zone and then spend 5 mins for some members to find a zone border by which to switch instances to be with their buddies. Also should allow for instance swapping without zoning out and back in at a border. Good example of instance management done right would be Age of Conan, where teams always enter the same instance and individuals can change instances from any rez pad. Yeah not being able to get into the same instance by default bothered me greatly. In general I’ve barely bothered with hunts or camping special fates because the instance system is a massive turnoff. You go and play FFV right now! I love the feeling the older FFs bring, and even parts of 7 and especially all of 9. The whimsical, super high-fantasy, magical charm that 4, 5, 6 and 9 in particular are like no other, and many parts of Stormblood have brought me back to that, especially the Deltascape raid (for reasons other than just the FF5 bosses)!